A couple new things rolled off the workbench so far this week. The first truly “new” things were 15 British Marines – from the Old Glory Pirate line. I’m just finishing up their officer this evening…. Some more Old Glory stuff. This technically isn’t new – and won’t be counted as such in my 2008 tally – but I thought I’d throw a picture up anyway. They were on multi-figure bases, but I thought they just didn’t look right mixed in with my other battalions so I tore them all off and mounted them on individual washers for skirmishing! The War Room table has rapidly been taken over by all things 18th Century! I slept in a bit (by sleep in I mean 7AM...). Then got up and made some Hummus and cut up some cheese and carrots and stuff to snack on while playing the last game of the weekend. 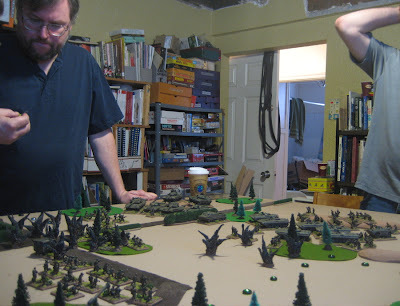 To cap off the weekend I ran a big Cold War Commander game. This was another World War Three set around 1988 using the background from the movie Red Dawn (NATO more or less dissolved, soviets invade England and North America). The Russian army has been pushing south through Northern Alberta. To continue their advance towards Edmonton they need to secure a place to cross the Peace River. After having been previously thrown back from their hasty attack on the Bridge at Dunvegan the relentless Russians have returned with a more prepared assault. The Soviet forces have suffered heavy losses in the recent weeks fighting and are desperately short on supplies and fuel. A British brigade which had been training at CFB Wainwright when the invasion took place had moved into the line and is relatively fresh. 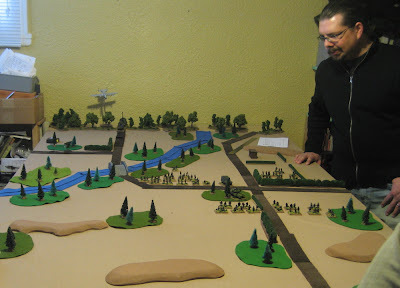 The soviets have 12 turns to take one or both of their objectives (the bridge across the Peace River and the Gas Compressor Plant). 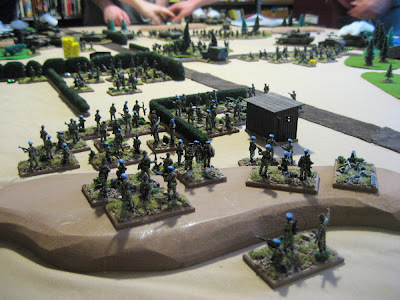 The British NATO forces start dug in. The Russians then take the first turn using mobile deployment. 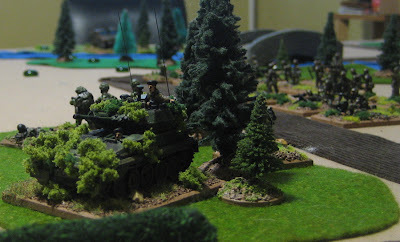 The American tank company will enter the table on the first NATO turn using mobile deployment on either of the roads on the south table edge. Gary, Darrin, and Andrej played the Russians, John burt and Jay played the NATO forces (until Jay had to leave and then I took over part of the force). 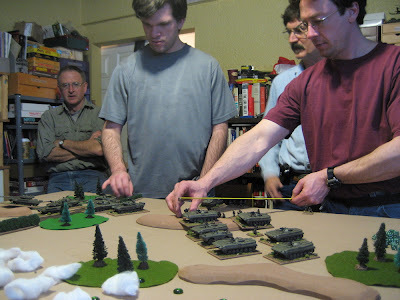 Gary had to spend some time planning his scheduled artillery assets – I helped him out be starting this process before people arrived (made a map and planned out some of the smoke and chemical assets). As Gary was finishing up and briefing his subordinates of the overall plan John and Jay set up their forces. Jay considering their defensive position. Up front is 2nd Bn, The Light Infantry. Behind them to the left (of the picture, towards the bridge) is the 3rd Bn, The Royal Greenjackets, and to the right and slightly to the rear (Guarding the gas compressor plant) is the 1st Bn, The Royal Greenjackets. The CO (in the Land Rover) is in a nice central location. 2nd Bn, The Light Infantry and the Brigade Recce platoon lurking in the woods. Turn One: the soviets smoked off the entire part of the front they were to advance on. Off to the left they hit with some sort of nerve agent – luckily for the NATO forces no one was positioned there! 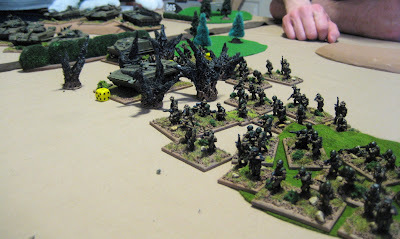 The Russians advance! Gary watches over his subordinates from close behind. Andrej, on the left, is commanding the tank battalion and Darrin, on the right, has the entire motor rifle regiment. John Bertolini is in the background, he came to observe for part of the morning. 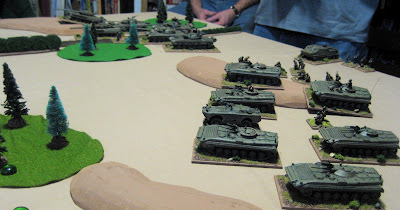 Soviet mechanized forces roll forward. The brits sitting in the smoke are no doubt getting nervous! They just looked so awesome I had to take lots of pictures before the NATO lads started to light them up! 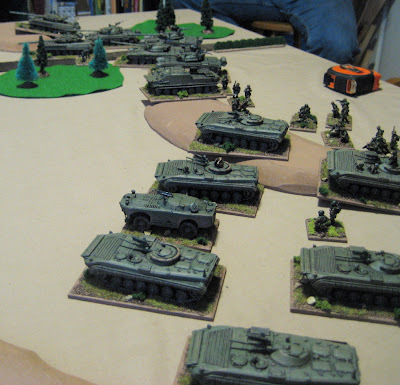 The Johns converse while Andrej continues to roll his soviet armour forward! 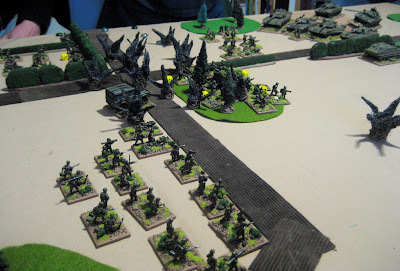 Darrin dismounted his BMPs at this point and the soviet advance ground to a halt as the cautious Andrej and Darrin decided to fire on the British for a bit rather than roll right over top of them! Then the A-10 started showing up and menacing the soviet armour! HUZZAH! 1st Bn, The Royal Greenjackets are caught in one of the soviets pre-planned barrages! 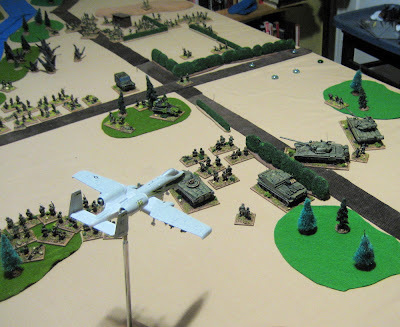 The A-10 continues to hammer on the Soviet armoured column. Two platoons of the Light Infantry were left behind – they had been suppressed when the battalion retired. Their position hampered the Soviets ability to maneuver in subsequent turns – because Andrej was to busy worrying about the American armour he didn’t want to spare any time assaulting the dug in infantry, only occasionally fired at them with his guns if one didn’t’ have LOS to the American tanks – which often suppressed – but for a while was unable to neutralize them. A jumble of soviet infantry battalions. 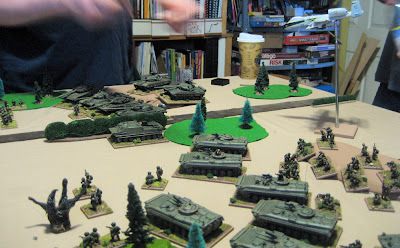 American tanks dueling with the soviets. They eventually lost. 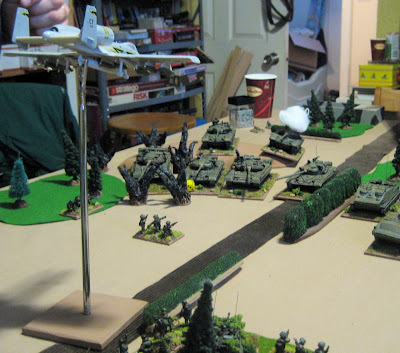 Turn Six brought the Soviet VDV in right on top of one of the objectives. The Soviet VDV immediately began to fire on the 1st Bn, The Royal Greenjackets, inflicting heavy casualties over the next couple turns! General positions around Turn Six. Half of the Soviet Tank battalion is gone – mostly thanks to the flight of A-10s. One of the M1 platoons has been taken out and the second is not long for this world. I think the M1s did take out a couple of their Soviet opposites in the process, however. On more than one occasion flights of SU-17 ran the gauntlet of NATO air superiority fighters and ground based AA to pummel the 3rd Bn, The Royal Greenjackets – you can see all the yellow dice marking casualties! Only on of the six original BMPs are still in business. I know a couple were taken out by The 3rd Bn, The Royal Greenjacket’s Milan platoon, and maybe a couple that got too close to platoons armed with Carl Gs… I think one of the BMPs took out M1s with their saggers..? More of the same. The suppressed Russians in the foreground were hit by the M109s of 3RCHA. The Brigade's Scorpion recce platoon and the remains of the Light Infantry hold their positions in the woods. Final postions on Turn Nine when the NATO force finally broke. Both 1st Bn, The Royal Greenjackets and 2nd Bn, The Light Infantry were reduced to less than company strength. 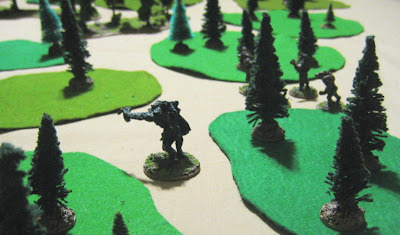 The Greenjackets had a single platoon still fighting, the LI two – though they were quite separated from each other and unable to support each other in any way. 3rd Bn, The Royal Greenjackets was still relatively intact. I imagine they would probably have retired across the Peace River to form a second line of defense there after covering the withdrawal of any stragglers from the other battalions. I did like this game – we tried some new things; counter-battery fire and chemical weapons. Considering that three of the players had never played before and John had only played once I think it played rather quickly and smoothly. After the game we finally ate the cake I had baked on Friday. I had meant to break it out earlier but we were just so busy having fun playing games all weekend that I never got around to it. Once again a big thanks to all of you that came out and played and made my first Wargames Weekend a resounding success! 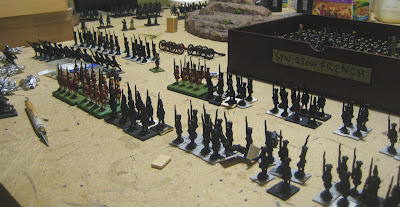 Work begins on my project for Tim’s Winter Wargaming Weekend 2009: Quebec 1759 ! I sent the players hunting in the woods at night for some werewolves that had been terrorizing the area lately. It was short and nasty. A Pack of Wolves on the hunt! A Greater Werewolf and his lesser wolfmen companions stalking their prey. The Wolves rushed Agnar Coppelstone and Andiel Vinestaff (Andrej and Darrin’s regular characters) and were hacked to bits in a few short turns. Here are Le Chevalier du Longuil, and a Captain and Sergeant of the Dukes Guard along with some local militia (Played by Jay, Cory and John, respectively). The Wolfmen charged this lot and were cut to pieces. 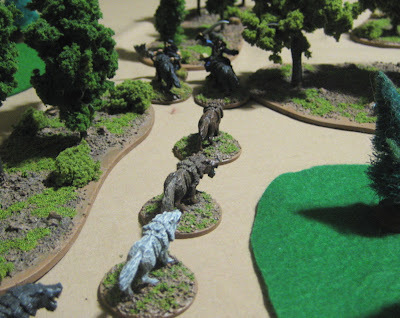 The Werewolf made a mess of Sir Pwent (Lloyd’s character) while Francis (Curtis’ character) stood by and discharged his pistol in the general direction of the werewolf – presumably to warn the others of their location – because they certainly didn’t go anywhere near the Werewolf. Everyone was kicked out by midnight, the table was cleared off, and then I set up for the next morning's game - I was in bed around 1AM. 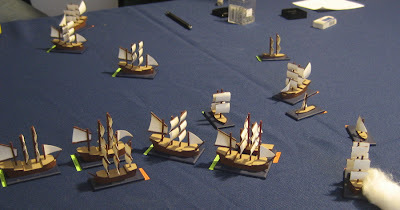 Saturday afternoon I broke out my wee ships for a bit of high seas action in the age of sail. 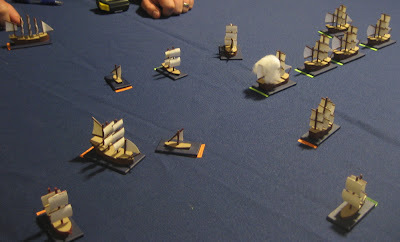 We used a modified version of the ship combat rules from Savage Worlds: Pirates of the Spanish Main . 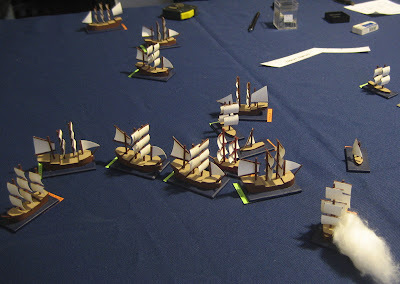 Some of my house rules can be found on another post (Tim’s Age of Sail House Rules for Savage Worlds). I ran a little play-test of this game two weeks before the event and found some more problems with the rules so I tweaked them further. Because I was sick most of the intervening two weeks I didn’t get to test them again with said tweaks before the big event – but they turned out just fine and, I think, made the game much better. I will finish typing them up and post them here shortly. I’ve also changed some of the ship designations. I think for most this was the highlight of the weekend! In attendance were: Cory, John Burt, John Bertolini, Jay, Darrin, Christian, Gary and, of course, myself. Action off the Coast of Luteland! “Bonnie” Prince Timmy, who has a tenuous (at best!) claim to the throne of Luteland, has lived his entire life in exile. As did his father. And his father’s father. And maybe even his father’s, father’s father… Really, I’m not sure when any member of his family sat on the throne of Luteland, but he claims it’s rightfully his so there it is. Whatever the case “Bonnie” Prince Timmy will not let another generation go by with those savage foreigners sitting on the thrown with their new religions and fancy pants! With the aide of the Duke of Lapindy he sails for the highlands and islands of Northern Luteland - where the staunchly conservative folk have never thought much of these “new” kings – to raise his standard for all supporters of the rightful king to rally to! 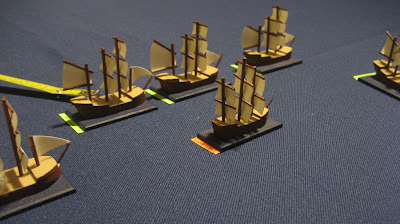 With him sails five transports carrying five battalions of troops – a couple raised from other Luteland exiles and a couple of Lapindy regulars. Though much was done to keep the expedition secret on the morning before their they were to arrive at their destination, as they crossed into Luteland waters a squadron of the Royal Luteland Navy was there waiting for them. Were they informed of the prince’s immanent arrival or was it pure chance they happen to be sailing these waters? It matters not – they were there and there was nothing for it but to try and run for the islands! The convoy of “Bonnie” Prince Timmy must sail off the Northern edge of the table for his side to win. 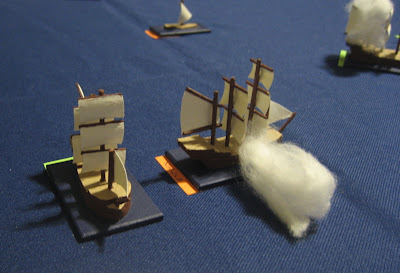 -1 for each ship damaged – or sloops crippled. 25+ Decisive/Stunning victory – the Admirals name will go down in history as one of the greatest naval Commanders! Titles will be bestowed! -20 or less DISASTER!! Your commander will be making a quick trip to the gallows and his family exiled, shamed for the rest of time. The action will in later years become synonymous with blundering idiocy! John Burt and Cory captained the escorts for “Bonnie” Prince Timmy’s convoy. I moved the transports. John Bertonlini played the admiral commanding the Luteland squadron and captained the Johann Karl. Jay, Gary, Christian, and Darrin all captained ships of the squadron. Initial dispositions of “Bonnie” Prince Timmy’s convoy and escorts. Not sure why the escorts were so damn far away. Both sides tried to be upwind of each other and so mostly deployed all along the western edge of the table (where the wind was coming from). This had disastrous consequences for us in very short order! On the left is the lead ships of the convoy. The smaller faster ships of the Luteland squadron can be seen swooping towards the convoy to menace them! Bonnie Prince Timmy’s convoy again and their escorts too damn far away… Luckily around the time this picture was taken Captain Corticus pulled the first of six (count ‘em SIX) jokers he’s draw throughout the game (with all that “luck” who’d have thought he should whine so….). 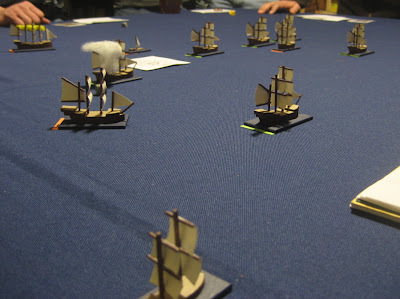 So we got to try out my fancy new Naval Fortune and Calamity and Naval Freak events tables… a roll on the freak event table brought us a rain storm! -2 to all shooting for the rest of the game or another freak event changes the weather… It was the only thing that kept us from being sunk in the next two turns…. 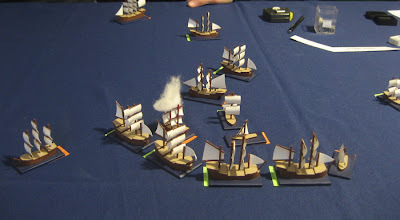 Unfortunately others were getting jokers as well – one of the Lutelanders rolled “out of ammo” – this is in the original fortune and calamity table and on the spot I decided to change it – as having one of our ships of the line being completely out of ammo for the rest of the game seemed unusually harsh! Instead I called it “low ammo/wet powder” and thus the Vauban, commanded by Captain Corticus would only ever be able to fire half the guns he would normally be able to fire under any given circumstances…. The Vauban takes the first shot – a long range pot shot at the North Star with one of it’s bow-chasers. The North Star crossed in front of the convoy and raked the Duchess of Lorraine causing one “wound”. Here the North Star, commanded by Captain Knudsen – a wily and cunning sailor (perhaps he missed his calling joining the Militia and would have done better in the Naval Reserve….) – has swung around the convoy and, shielded from the escorts by the convoy itself! The North Star then proceeded to unleash broadsides along the whole line of transports. The first broadside into the Duchess of Lorraine (aided by a “teamwork” result on Darrin’s Joker allowing Christian to act on the card and receive the +2 bonus to all rolls for the turn) caused three more “wounds” leaving it crippled and on fire! On it’s action card The Duchess of Lorraine (seen here burning) was consumed by the fire and sank! Perhaps an additional effect of a rain storm should be a -1 to rolls on the Fire Table, as The Duchess would not be the last of the transports to burn and sink in the middle of a rainstorm…!? Lest the rest of the ships of the Luteland squadron get around the convoy (not to mention to avoid the sinking ruin of the Duchess of Lorraine) the nest ship in line turned the convoy south to block others from following the North Star! At this point the Red Snapper, a privateering vessel in the service of Luteland, was close enough to invoke their special rule…. Any time an enemy ship with bennies (we all started with a few) sailed within 12” of the Snapper they could try and buy their services. To do this one gave the Snapper a benny and then diced of with them – high roll from the Snapper’s captain meant they remained loyal to the side they were currently fighting for, high roll for the potential buyers captain meant the Snapper switched sides! The snapper switched sides at least four times this turn, ending up on our side which had dire results for the Luteland squadron within whom the Red Snapper was conveniently positioned! 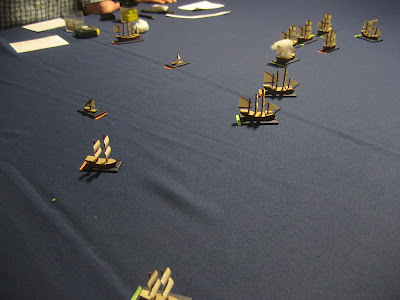 Broadsides to the Ostholm and Nordlo on either side resulted in two wounds to the Ostholm damaging cannon, fouling their rudder and starting a fire! The Nordlo escaped without any serious damage. The burning ship in the bottom right is the Ostholm, commanded by Captain Chappell. What a MESS! All these ships at incredibly close range, all firing broadsides at each other… if it hadn’t been for the rainstorm there would have been much more carnage. MUCH more. 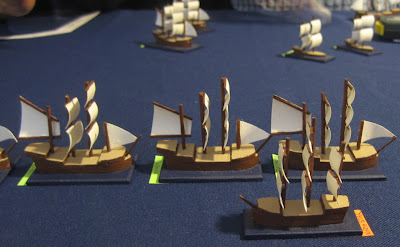 As it was ships of the line would fire entire broadsides and cause no hits… it was madness. The Ostholm burned and sank. As Captain Knudsen had to leave to attend some family gathering Captain Chappell swam over to the North Star to take over just as it was coming about. I think this is where the Johann Karl unleashed a broadside on the Vauban (the two ships of the line at the top of the picutre) – which should have been devastating – but the Vauban sailed on unscathed!? I think it was the Nordlo, commanded by Captain Mudie, which fired on the treacherous Red Snapper and set it afire! The North Star coming about, preparing to give chase! The fire went out on the Red Snapper, then it changed sides again… a couple mre times. I can’t remember whose side it was on in the end…. But some one fired on it crippling the frigate and it sat in this position for the rest of the game. It took a couple more shots from other ships that happen to be passing by as they came about – which was rather unsporting – but managed to survive the day. The Snow has fired on the Harfleur – the last transport in the line and set her ablaze. A number of crippled ships have been left behind to be salvaged by the victors after the game. Fire rages on aboard the Harfleur. At some point here we took a break and went for supper at Amigos. I think Darrin took over the Johann Karl as John didn’t return with us after supper. Here the Harfleur has been further damaged by the fire and is dead in the water and continues to burn. I suggested that the strong winds should also blow out the fires on the Harfleur… nobody seemed willing to go for that though… I can’t see why…?! Here the Harfleur has burned and sank, the Toulon continues to burn – flames being fanned by the strong winds. 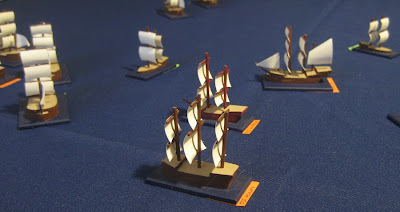 The Vengeur has turned away – so I turned the convoy to sail along with it hoping it may be able to continue to offer at least SOME protection. 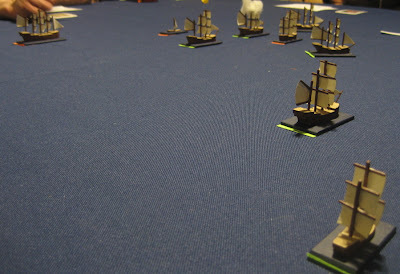 Here the Marseille is about to sail off the table – still being harassed by one of the Lute’s sloops. As I said everyone had a great time playing this one. Even the whining from Captain Corticus was at a minimum (perhaps even he was sick of listening himself at this point, or perhaps getting to “tear up [Jay’s] stern, navy-style” so filled him with glee he just plain forgot to… or perhaps it was all drowned out by the rain and the roar of the cannons). The action would have been much quicker had it not been for the rain. Nobody seemed to mind, though. We started at 2pm and (after taking a break for supper) finished around 8:30-9PM(!? ), but everyone was having a great time right up to the very end! In total we played out about 28 turns. 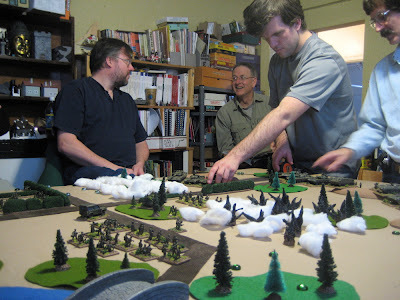 I think the long drawn out battle actually helped give everyone time to really learn the rules (as there were many playing the system for the very first time). I felt the changes to the rules all worked exceptionally well – as I mentioned I will post these soon. John Bertolini’s actually gone and started making some new wee ships of his own since Saturday. Both Christian and Gary have said they’d like to play again. So we shall probably see this showing up at regular game nights in the near future. 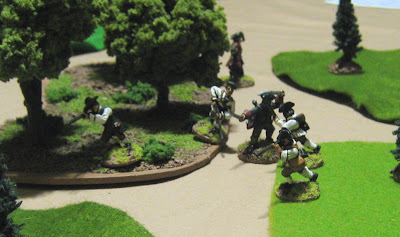 The Lutelanders scored a total of +7 victory points, a minor victory, having successfully prevented four of the five transports from getting through, but suffered much damage themselves. The Lapins and “Bonnie” Prince Timmy suffered a disastrous defeat! -43 victory points!? He would have to land in Luteland with only one battalion of troops. Hopefully many disaffected Lutelanders will rally to his cause and fill the ranks of his army!